Fluide de Beauté 14 Caritas classic body oil Fluide de Beauté 14 is the perfect all around oil, a well known classic to say the least. It works both for face, body and hair but personally I prefer to only use this on my body only. But don’t get it twisted, this is not a pure oil like for example 100% argan oil, instead it is a mixture of different ingredients and some oil. It is stated that you can use it together with your day cream or foundation to nourish the skin a bit extra. I might just try that to get that dewy look. 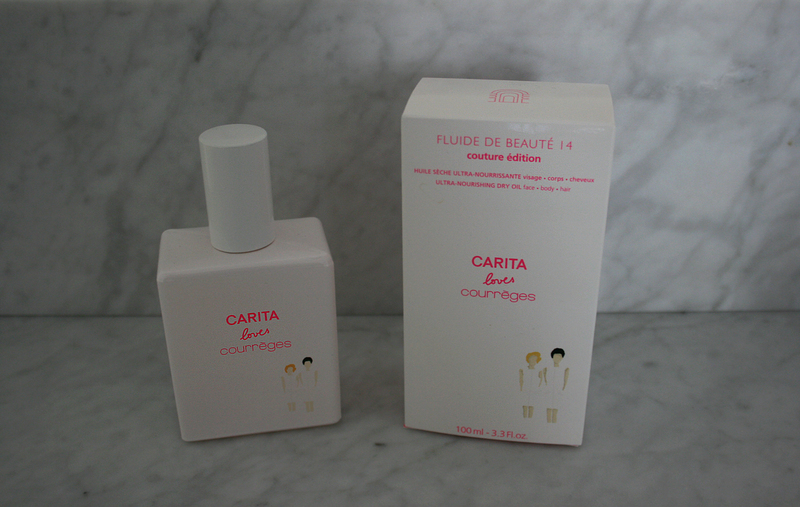 This bottle is designed by the french fashion house Courrèges to honor Caritas 70 year anniversary. I love this bottle sooo much I am def saving it when the product runs out. Also what I love about this limited edition bottle is that it comes as a spray, perfect for applying oil if you ask me. It can get so messy and easily too much oil when you pour it in your hand, but this I just spray on my feet, knees, elbows and decolletage and it makes the skin feels so smooth. Jag blev dock inte imponerad av ingredienslistan när jag testade denna. Huvudingrediensen är mineralolja. Finns betydligt bättre oljor för billigare penning enligt mig. Det är väl inte helt säkert hur mineralolja påverkar huden men tillräckligt tveksamt för att jag ska välja något annat alternativ iaf. Gillar din blogg btw!